It can be hard to motivate yourself to exercise when you've got your period, so the idea that doing so might burn more calories is an appealing one. The scientific evidence doesn't seem to back this up, however. This doesn't mean you shouldn't exercise, as it will still burn more calories than staying inactive and may help with a few of the premenstrual symtoms some women suffer from, such as bloating. A woman's metabolism isn't stable, as her resting metabolic rate can vary throughout her menstrual cycle. 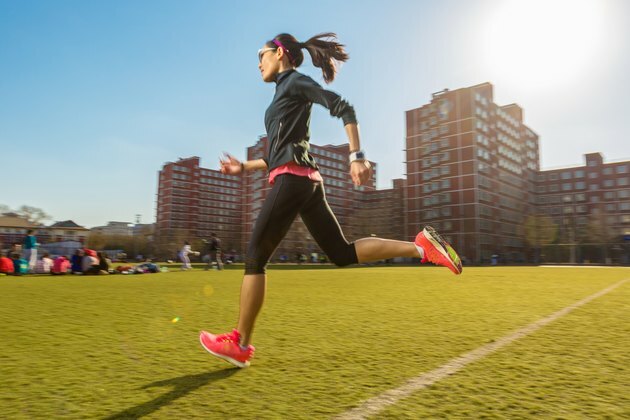 You don't usually burn more calories when you exercise during your period, but you may burn more calories when you exercise during the luteal phase of your menstrual cycle, which is just before your period -- especially if you are on a low-carbohydrate diet, according to a classic study published in the Journal of Physiology and Pharmacology. A study published in the British Journal of Nutrition in 2003 found different results, however. It found that the RMR varied throughout the menstrual cycle, but didn't necessarily get higher right before menstruation and then lower once a woman's period started. There isn't a specific time during your menstrual cycle during which it's guaranteed you'll burn slightly more calories. A study published in the Pakistan Journal of Biological Sciences in 2014 noted that women's body weights don't significantly change throughout the menstrual cycle either, although there was a slight increase right before menstruation. Even if you don't burn more calories when exercising on your period, it's still a good idea to keep exercising. You'll be burning more calories than if you don't exercise at all. Weight loss due to exercise also appears to target abdominal fat more than other fat, according to a study published in Medicine and Science in Sports and Exercise in 2003. For the best weight-loss results, you'll need to do a mix of aerobic exercise and resistance training. The aerobic exercise burns a significant amount of calories, while the resistance training builds muscle, which increases your metabolism slightly. Aim for 300 minutes of moderate aerobic exercise and two resistance-training sessions per week if you're trying to lose weight, recommends the Department of Health and Human Services. Some women become bloated right before their periods begin and at the beginning of their period. Exercising helps to speed up the passage of gas through the digestive tract and minimizes bloating. This can make it seem like you're losing weight as any extra water weight goes away, and the stomach flattens out a bit as the gas is removed. Perhaps this effect is responsible for the myth that you burn more calories during your period. Increasing your fiber and protein intake may help slightly increase your metabolism, and thus the number of calories you burn, according to the American College of Sports Medicine. Try to get at least 18 to 20 percent of your calories from lean proteins, as these take more energy for your body to digest and also help you feel full. Fiber may make it so you absorb fewer calories and also slows down the emptying of your stomach so you don't get hungry as quickly. Make sure you don't cut calories too much, as this slows down your metabolism. Women should get at least 1,200 calories per day to minimize this risk. World Journal of Gastroenterology: Bloating and Functional Gastro-Intestinal Disorders: Where Are We and Where Are We Going? Can Exercise Cause Breakthrough Bleeding?